Does a Tow Truck Driver Have an Obligation to Warn of a Tow Scene? Home » The Law & You » Does a Tow Truck Driver Have an Obligation to Warn of a Tow Scene? A viewer’s husband had collided with a tow truck. There was no time stop before the accident. Did the tow truck driver have an obligation to provide a warning of the tow scene? Fellerman & Ciarimboli truck accident attorneys Ed Ciarimboli and Harry McGrath explain the situation. Dave Kuharchik: We’re talking about a tow truck accident for this edition of “The Law & You.” Back with us tonight, attorneys Harry McGrath, who is here for Greg, and Ed Ciarimboli. Good to see you guys and Greg will be back soon, I guess? Ed Ciarimboli: Well, we were talking about his t-shirts last night I think he took forty-seven of them on vacation with him. We don’t know how long he’ll be gone. Dave: A t-shirt for every day. Here’s our question tonight. This is from Linda in Dunmore. Linda says, “I was driving with my husband last week and collided into the back of a tow truck. It came up out of nowhere and we had very little time to stop. Does a tow truck diver have an obligation to provide warning of the tow scene?” That’s an interesting question. What should Linda know here? Ed: I’m going to let Harry McGrath answer this question because nobody knows more about this than he does. He is in the middle of litigating this exact case. So Harry, tell them what the law is. Harry McGrath: The law in Pennsylvania requires that a tow truck driver does provide advanced notice at a tow scene like this. That includes putting out triangles, advanced warning devices at several hundred feet in front of the accident. If you do find yourself in a situation where you collide with a tow vehicle and there is no advanced warning and if your injured, there’s a good chance you’re going to have the ability to recover. Ed: I told you. See, you know. We hire smart people. Dave: Because Harry got right to the point today, we have time to get to the information out there, how can people contact you if they have a case? Ed: Well, call us 570-714-HURT. You could see us on the web at 714hurt.com. Twitter, Instagram, Facebook, LinkedIn, Google+, Snapchat, whatever else there is. We’re on them all. Somebody, social media. Dave: Imagine that for this accident. You take a picture for your records, then use Snapchat. Ed: I know, smoke screen, I mean anything. Send us a telegram, Morse code, we’ll do it all. 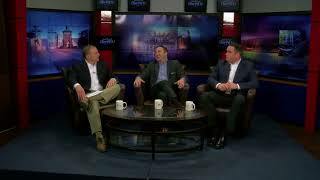 Dave: Results matter with attorneys Harry McGrath and Ed Ciarimboli. Gentlemen, thank you so much.